Trading opportunities on the currency pair: On Friday, the 11th of August, trading on the GBPJPY pair closed around the TR3 trend line. In this idea, I’ll be looking at the possibility of an upwards rebound and a breakout of the resistance zone of 147.50 – 148.50 in a triangular formation. Friday’s candlestick closed with a hammer. If the price grows to 142.62, and better yet, if the day closes above this level, it will be a precursor to a further rise in quotes. After that, traders should use the subsequent downwards correction to find an entry point for a long position with a target of 147.81 by the 20th of September. If we break 147.81, we can set a target of 161.60. The last idea on this currency pair was published on the 6th of February. At the time of publication, the British pound was trading at 140.46 JPY. Buyers didn’t manage to break the TR2 trend line. 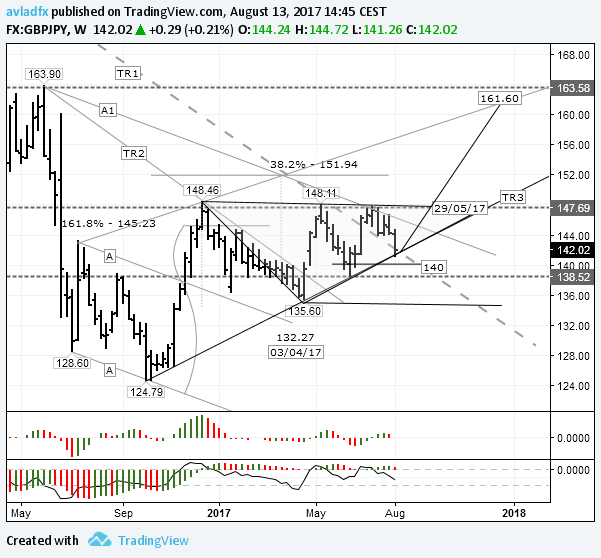 The price was expected to form a triangle and to exit it downwards in March towards 132.27 level, from which the price was expected to restore to 144.53/60. In March, the price exited the triangle downwards. It dropped to 135.60, from where the pound appreciated against the yen by 1250 pips to 148.11 in the space of 4 weeks. For several weeks, the pound has been consolidating around 145. Pressure on it has increased in the last week due to a rise in tensions between the US and North Korea. Both countries seem ready to attack one another. The UK, China and EU are all calling on the US to bring about a diplomatic solution to the crisis. On Friday, the 11th of August, trading closed around the TR3 trend line. In this idea, I’m looking at an upwards rebound from here and a subsequent breakout of the resistance zone at 147.50 – 148.50. I’m rather counting on a triangular formation here. I don’t think it’s a good idea to sell yen on Monday, not until the North Korea situation is resolved. Below is the weekly chart, so first we should wait for some buy signals on the pound on the daily and 4-hour charts.